Would you like to learn to sail together with your friends or family, rather than with strangers? Our private training and cruises are exactly what you are looking for. - a fully fledged RYA course just for you and your family? - a bespoke tuition for your new own boat, just for you and your partner? - a skippered holiday week for your friends or family? - a mixture of cruising and learning? - a mile building trip with night hours and night navigation? You tell us what you need and we will organise it for you and accompany you all along! - Max 5 people/boat (more boats possible). - Start from Marina Kastela (Croatia). - Duration: one full week (Sat to Sat). - up to 8 - 10 people/boat (more boats possible). - Any location (Croatia, Greece, Italy, ...). - No previous experience necessary. - Duration: one or two weeks. - Flexible number of people. - Any location (Croatia, Greece, Italy,...). - Duration: one full week. 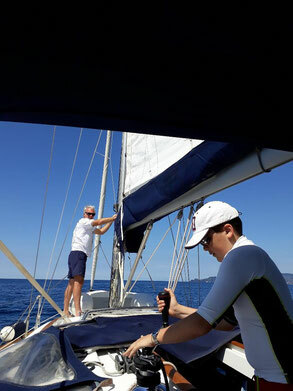 - Their professional qualifications (all of us are at minimum qualified as RYA Yachtmaster Offshore, and have sailed and taught for thousands of miles). - Their passion for what they do: we all just love being on the water! Transferring our passion to anyone willing to learn or join in is what keeps us going! Important for you to know, at White Wake sailing safety comes always before anything else! You can rest reassured that should the weather not play for us, our skippers and instructors will always put the safety and comfort of crew, students, guests first. Use the form below, send us an email at info@white-wake.com or give us a call at +43 66488360842. Briefly describe what you are looking for, preferred location, number of people, time of year, max budget, etc. We will get back to you with a few options and proposals (or some more questions). Please also include your telephone number, so it will be easier for us to contact you!